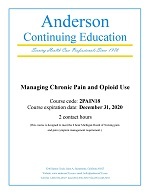 This course is designed to meet the 2 hour Michigan Board of Nursing pain and pain symptom management requirement. The Opioid Crisis in 2017: What's at Stake? Long-acting Opioids at What Cost? How Can Nurses Safely and Expertly Manage Patients’ Pain in the Political and Social Climate of 2017, given the Realistic Fears Caused by the Opioid Crisis? Where is the Chronic Pain Patient in the Current Political and Medical Climate?